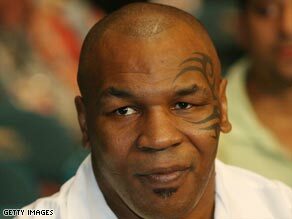 (CNN) -- The 4-year-old daughter of former heavyweight boxing champion Mike Tyson died Tuesday, a day after she was injured in a treadmill accident at her home, police in Phoenix, Arizona, said. Former world boxing champion Mike Tyson traveled from Las Vegas to Phoenix to be at his daughter's bedside. Exodus Tyson was pronounced dead at 11:45 a.m. local time Tuesday, said Sgt. Andy Hill, a Phoenix police spokesman. "The Tyson family would like to extend our deepest and most heartfelt thanks for all your prayers and support, and we ask that we be allowed our privacy at this difficult time," the family said in a statement. The girl's 7-year-old brother found her on a treadmill in the Phoenix home Monday. She had been strangled by a cord connected to the machine, said Sgt. Andy Hill of the Phoenix Police Department. "We believe the child was on the treadmill but it was not running at the time. She might have been playing like it was," Hill said. Her brother called his mother to the room. She removed Exodus from the machine and called 911. The girl's mother performed CPR on her, but she was unconscious and in need of life support by the time authorities arrived, Hill said. Former world heavyweight champion Tyson on Monday traveled from Las Vegas, Nevada, to Phoenix where his daughter was on life support in critical condition, police said. About 1,000 children under 14 die of unintentional strangulation each year, 88 percent of whom are under 4 years old, said Larry Stone, founder of Safety Matters, a company that specializes in childproofing homes. Stone said injuries involving treadmills were fairly common, but said he had never heard of strangulation involving a treadmill. The 42-year-old Brooklyn-born Tyson became the youngest world heavyweight champion in history when he lifted the World Boxing Council title aged 20. Tyson also won the WBA and IBF versions of the crown during a career that was littered with controversy including disqualification for biting Evander Holyfield's ear during a 1997 title rematch. He retired from the sport in 2005, but was back in the news this month with the U.S. release of the film "Tyson," a documentary that premiered at the Cannes Film Festival last year.